Background: Concerns have been raised over the safety of methylphenidate (MPH), with regard to adverse effects on growth and blood pressure. 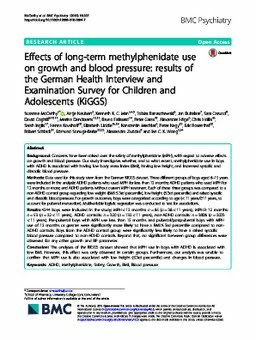 Our study investigates whether, and to what extent, methylphenidate use in boys with ADHD is associated with having low body mass index (BMI), having low height, and increased systolic and diastolic blood pressure. Methods: Data used for this study stem from the German KiGGS dataset. Three different groups of boys aged 6-15 years were included in the analysis: ADHD patients who used MPH for less than 12 months; ADHD patients who used MPH for 12 months or more; and ADHD patients without current MPH treatment. Each of these three groups was compared to a non-ADHD control group regarding low weight (BMI ≤ 3rd percentile), low height (≤3rd percentile) and raised systolic and diastolic blood pressure. For growth outcomes, boys were categorized according to age (< 11 years/≥11 years, to account for pubertal maturation). Multivariable logistic regression was conducted to test for associations. Results: 4244 boys were included in the study; MPH < 12 months: n = 65 (n = 36 < 11 years), MPH ≥ 12 months: n = 53 (n = 22 < 11 years), ADHD controls: n = 320 (n = 132 < 11 years), non-ADHD controls: n = 3806 (n = 2003 < 11 years). Pre-pubertal boys with MPH use less than 12 months and pubertal/postpubertal boys with MPH use of 12 months or greater were significantly more likely to have a BMI ≤ 3rd percentile compared to non-ADHD controls. Boys from the ADHD control group were significantly less likely to have a raised systolic blood pressure compared to non-ADHD controls. Beyond that, no significant between group differences were observed for any other growth and BP parameter. Conclusion: The analyses of the KiGGS dataset showed that MPH use in boys with ADHD is associated with low BMI. However, this effect was only observed in certain groups. Furthermore, our analysis was unable to confirm that MPH use is also associated with low height (≤3rd percentile) and changes in blood pressure.